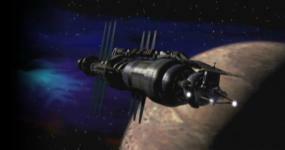 The Minbari remind me a bit of the Mri in CJ Cherryh's Faded Sun trilogy. Not a lot of similarity, except in the aspect of their caste divisions, segregation of information to within these castes, and their Spartan and somewhat fatalistic acceptance of duty without understanding, with a deeply instilled sense of honor. And their mythos that they were created from the stars (which it is true that all the matter we're made of came from the insides of exploded stars, but spiritually they see this as well, rather than "from the earth" or "from dust", which is also true in the same fashion). Everything else diverges greatly from there, and their fates are certainly very different, but that aspect of Minbari culture struck me as familiar from having read this trilogy (a long time ago). I'm treating this thread, btw, as a place to point out similarities with other fictional races in sci-fi, without in any way suggesting or implying JMS lifted these. The "Moties" in Niven and Pournelle's Mote in God's Eye also have these kind of castes and segregation of information and purpose, only it carries further into physical differences and evolutionary branching. I'm not sure if Minbari caste placement is based on birth or an individual's "calling"--the other two examples are based on birth (IIRC in the case of the Mri). We do know they can change castes, which is different from the other cases. Earth: post WWI Germany. The United States, 19th century. Expansionary, arrogant, a new power, alternately fascinating or distasteful to other nations. The new kids on the block in terms of political power. Narn: post-WW1/Ottoman Arab/Persian mid-east nation state. Justifiably angry, corrupt, expansionary, major chip on their shoulder, tribal. Minbari: India or Chinese at the height of their power, i.e., Moghuls or Han Dynasty. Militarily powerful but strongly spiritual. Caste system. League of Non-Alligned Worlds: current Europe. The League of Non-Aligned Worlds reminded me more of the Non-Aligned Movement started by the Bandung Conference in 1955, a response by many third-world nations to the Cold War and the last vestiges of colonialism. These nations had little say in the direction of the emerging world order, and wanted to assert more say by banding together. Likewise, the Non-Aligned worlds felt they were given little say (c.f. Deathwalker) in Galactic affairs and were willing to flex their muscles as a group when need be to have more say. But they ended up divided in the Shadow War, which was kind of analogous to the Cold War (non-engagement between Shadows and Vorlons, using younger races as proxies)--just as no real third-world bloc emerged strong enough to counter the use of these nations as pawns in the Cold War. The ISA was kind of like a European Union though, only encompassing most of the "world" (galaxy).